MACON, Ill. – Ryan Little of Pleasant Plains carries the lead in Midwest Big Ten Series late models heading into the weekend, when the tour hits Jacksonville (Ill.) Speedway Friday before reaching the Mueller Distributing Miller Lite Beer Twin 50’s Saturday at Macon Speedway on IHOP Night. The program at Macon Speedway includes a 50-lap feature for Big Ten late models and a 50-lap feature for Billingsley Towing modifieds. Little, who won earlier this season on the legendary fifth-mile high banked oval at Macon Speedway, compiled 210 points in the first four Big Ten late model races to build a lead over Matt Taylor of Springfield and Greg Kimmons of Pleasant Plains. They are tied for second with 192 points. Jake Little of Pleasant Plains is fourth with 156 points, followed by the Springfield trio of John Beck (154), Brian Divley (152) and Roger Brickler (120). Defending Big Ten late model champ Steve Sheppard Jr. of New Berlin has 118 points after skipping the last two events, ahead of Justin Reed (110) and New Berlin’s Kenneth Vandorn (86). The champion is determined by a driver’s beset eight finishes in the 10-race campaign. Sheppard, Divley and Central Illinois hotshot Bobby Pierce Jr. also won Big Ten late model races this season. After this weekend’s Big Ten late models doubleheader, the series resumes racing with back-to-back races at Lincoln Speedway on July 18, Macon Speedway on July 19 and Quincy (Ill.) Raceways on July 20. The season concludes at Lincoln Speedway on Aug. 8. 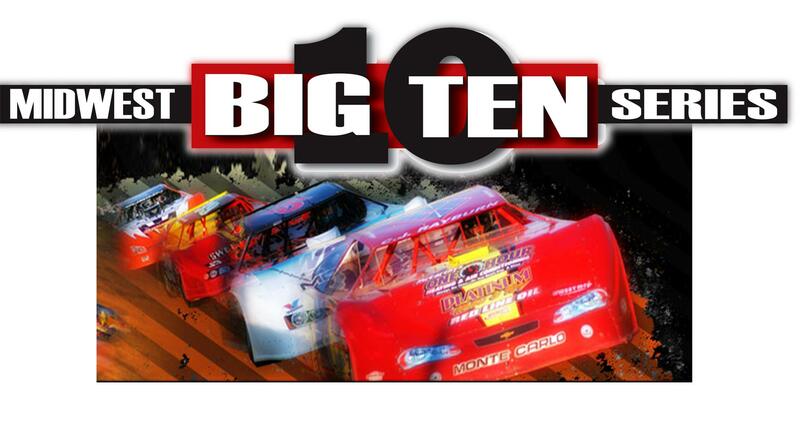 The Big Ten Series features a $5,000 points fund and a $2,000 prize to the overall champion. The fund pays through the top 10. Gates open at 5 p.m. with racing at 7 Saturday at Macon Speedway. Street stocks, outlaw hornets, stock hornets and B-mods also race.